On Saturday Bart and I gave a keynote on Global Networking at the SMILE conference in Milan. We were invited by Italian educators Mariella Brunazzi and Elena Fusar Poli, who organized the conference that marked the closing of their multinational Erasmus + project SMILE. There were 300 educators from 8 countries at the conference. Our keynote was very interactive and involved a lot of activities that the audience had to do. We even made them dance and they greatly enjoyed it. Padlet is now even more awesome! I just discovered that Padlet introduced some excellent new features which are definitely going to make our teacher lives so much easier. 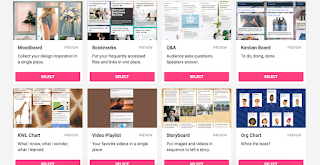 Besides creating a Padlet as a blank page, it is now possible to choose from one of the eight different templates (BTW, more templates are about to come and what's more, the kind Padlet folks will even create a new template if you tell them what you want!). My absolute favorite template, one that I've been dreaming of for many many years is the interactive KWL chart! It's easy, it's user-friendly, it's intuitive and it takes just one click to create - simply put, it's perfect. And you can add as many columns as you wish! The other templates that I'll no longer be able to teach without are Q&A, To Do List aka Kanban Board and Storyboard! Moodboard, Bookmarks, Video Playlist and Org Chart will come in handy too!